Projections based on climate models are used to convince politicians to reduce the emissions of CO2 to save the world from overheating. The latest warning is that a global temperature increase of 2.7K is the lower limit possible in 2100, if the emission control works as proposed for the Paris meeting. I will describe how climate models developed by James Hansen et al. (1988) have failed to predict how the global temperature has changed until now. If we cannot stop the building of more coal-fired power plants, those coal trains will be death trains – no less gruesome than if they were boxcars headed to crematoria, loaded with uncountable irreplaceable species. Figure 1. Global temperature predictions based on 3 scenarios (A, B and C) as described in the text. The hatched area represents the maximum temperature in the present (Holocene – 6000 yr ago) and previous (Eemian-­120 000 yr ago) interglacials (1). The solid black curve represents observations. by Nils-Axel Mörner : Paleogeophysics & Geodynamics, Stockholm, Sweden. Leonardo da Vinci (1452-1519) insisted that we should first read the book of Mother Nature, and only subsequently read books written by man (see p. 144 and 175 in “Planetary Influence on the Sun and the Earth, and a Modern Book-Burning, Nova Sci. Publ., 2015). No one has read the book of Mother Nature better than our honorary president Charles Darwin. Besides, his words of 1871: “false facts are highly injurious to the progress of science” can stand as a declaration for our new Independent Committee on Geoethics (founded on October 17, 2015, in Prague). The Origin of Species by means of Natural Selection (Darwin, 1858) – i.e. his theory of a continual evolution of life throughout the Earth’s history – is proven correct by all means. We may even say that those who deny this (i.e. the “creationists”) do not represent science, progress and logics, but simple anti-scientific illusion (Fig. 1). Fig. 1. 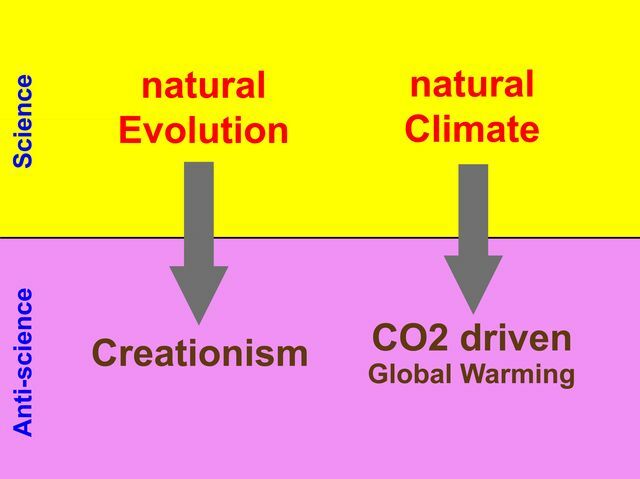 Science vs anti-science: Natural evolution and natural climate vs creationism and CO2-driven global warming.